Fran Merida celebrates scoring in this match last year. Check below for our Classic Football Shirts competition winner! In terms of how the squad looks (aside from the mental questions,) there's very little in terms of injuries to discuss, which as I keep saying, is a breath of fresh air. Arsenal lost Abou Diaby on Wednesday to a calf injury, which means Denilson will return to the bench; that means Alex Song and Jack Wilshere are pretty much guaranteed to both start in the midfield. Wojciech Szczesny, who saved the point at White Hart Lane on Wednesday, will continue in goal with the same ever-so-porous defense in front of him. You would have to think that the front will continue much in the same way as well. The problem for Arsenal lately has not been the starting side, but rather tactics and substitutions in the later stages (in addition to panicking at the back.) I'd like it if Arsene Wenger would stop bringing Nicklas Bendtner on, then sticking him on the wing; he's useless there. Matt Taylor and Mark Davies have overcome recent injuries and will return to the side, while Daniel Sturridge, on loan from Chelsea, will be re-inserted into the line-up, after being cup-tied in the FA Cup Semi-Final last weekend. The three will likely replace any number of Bolton players who have been showing signs of fatigue lately, which could possibly Johan Elmander, Martin Petrov, or Ivan Klasnic. The returns of Taylor and Davies leaves three Trotters players out with injuries. American international Stuart Holden's season is over after a knee injury suffered at Old Trafford a few weeks back after a harsh tackle from Jonny Evans. Sean Davis and Sam Ricketts are also long-term absentees for the side. So much of the past few months of Arsenal's season in the league reminds me of The Simpsons' commentary on the sport: "fast kickin', low scorin', and ties? You bet!" The Gunners may be unbeaten in their last 16 league fixtures, but drawing eight of them has meant a collapse from contention for the league title. And the draws since the start of March have been the worst. A 0-0 against Sunderland that should have been a 1-0 win. A dreadful 0-0 with Blackburn. The past week debacles against Liverpool and Spurs. Sure, this team has not lost a league fixture since December, but that doesn't tell the entire story. 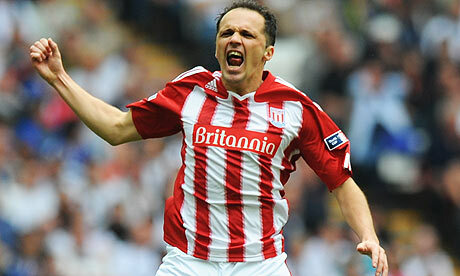 Bolton got crushed by Stoke in the FA Cup Sunday. That makes me extremely sad. Photo: Guardian. Last week, Bolton went to Wembley to take on Stoke City in a chance to qualify for the FA Cup Final and were thrashed out of the competition by a 5-0 scoreline. There is a stark contrast between how Bolton has performed at home compared to how they have performed on the road. Away from the Reebok, the Trotters have only beaten the league's two last placed teams, West Ham and Wolves. They have lost on the road against the top six placed teams at the moment. However, at home, Bolton have only lost twice: 4-0 to Chelsea and 1-0 to Liverpool. They've won nine home fixtures and have also drawn five at home, including a 2-2 draw with United. The 4-0 loss to Chelsea on January 24 was the last time they dropped points at the Reebok; Bolton has won four straight at home since. Laurent Koscielny scored his first Arsenal goal in the reverse fixture, but a defensive break-down (I've never heard of such a thing!) led to the match being 1-1 at the half. Arsenal dominated the second with goals from Marouane Chamakh, Alex Song, and Carlos Vela, the latter's goal coming after a string of over twenty passes. Cesc Fabregas had three assists. Arsenal won both fixtures last year, which were played over the span of four days after the meeting at the Emirates was postponed twice. 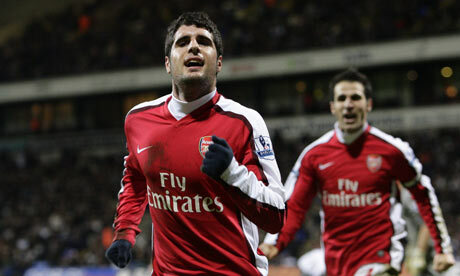 At the Reebok, Arsenal got goals from Cesc Fabregas and Fran Merida (yeah...) in a 2-0 win. Then, midweek in London, Arsenal fell behind 2-0 before storming back, equalizing controversially, and then coasting. Arsenal's goals came from Tomas Rosicky, Cesc Fabregas, Thomas Vermaelen, and Andrei Arshavin. The two goal win put Arsenal (momentarily) top of the league, thanks to goal difference. Arsenal has won their last eight league fixtures against Bolton. The Trotters last win was a 3-1 win at the Reebok in November of 2006. Nicolas Anelka had a brace. The referee is Chester-based Mike Jones. In three matches Jones has taken charge of this year involving Arsenal, the Gunners have not conceded a goal. This includes two wins and a draw (6-0 over Blackpool, 1-0 over West Ham, and 0-0 with Man City.) All three were played at the Emirates. Those matches involved three red cards, but only one to Arsenal, for Bacary Sagna's head-butting incident at the end of the City draw. The clean sheet theme continues for the only match Jones has worked for Bolton Wanderers this year; the Trotters lost that match 1-0 at Chelsea. United blew a 3-1 lead at Everton in September. Wow, blowing a 3-1 lead. Where have I heard that recently? These are the reverse fixtures of those played on the weekend of September 11-12. Manchester United, who now are even more odds-on favorites to run away with the title, kick the weekend off at Old Trafford against Everton. 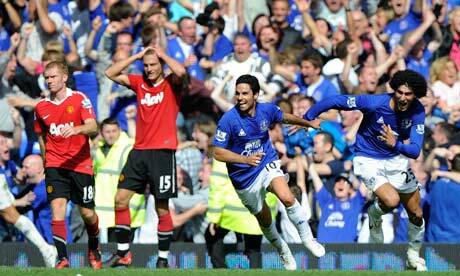 United blew a late lead, allowing two goals in added time, to draw with the Toffees 3-3 at Goodison Park int he reverse. Six matches take place during the usual 10 a.m. Saturday, 3:00 p.m. in England, start time: Aston Villa hosts Stoke City, Blackpool hosts Newcastle, Birmingham City heads to Anfield to take on Liverpool, Sunderland hosts Wigan, Wolves host Fulham, and Spurs host West Brom. The late Saturday match is a London derby, as Chelsea hosts West Ham at the Bridge. On Monday, the weekend comes to a close as Blackburn Rovers host Manchester City at Ewood Park. Arsenal's match is the only Sunday fixture. We've checked the entries and powered up our random number generator to see just who would win a £100 ($163) credit to Classic Football Shirts. The results are in and congratulations are in order for our winner, Jeffrey Breton!! And, in case you're curious, the correct answer to the trivia question, Arsenal's home matches in the 1998-99 Champions League season (and the next year as well) were significant because they were played at Wembley Stadium.